The Retrogaming Times has a much longer legacy than the currently running newsletter you are reading today. The Retrogaming Times is the current and most recent version of a publication that has gone by different names across over twenty years. Originally, Retrogaming Times began publication in 1997 and continued until 2004. 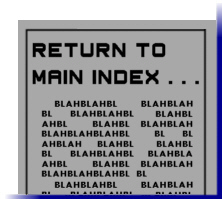 During this time, Bit Age Times ran sporadically along side Retrogaming Times and was focused on the then "modern classic" era, before being folded into the regular newsletter. A continuation, Retrogaming Times Monthly began publication in 2004 and continued until 2014. The Retrogaming Times began as a further continuation in 2016 and continues to this day. With over twenty years of content across multiple incarnations, multiple editors and publishers, and multiple hosting and publishing locations, this single repository was created as a complete newsletter legacy archive. Every issue of the "Retrogaming Times" family of newsletters has been archived into .PDF file format and can be directly downloaded here. Each download is contained in a standard .ZIP file. Standard (Letter) - Regular letter size pages, suitable for printing on common paper. 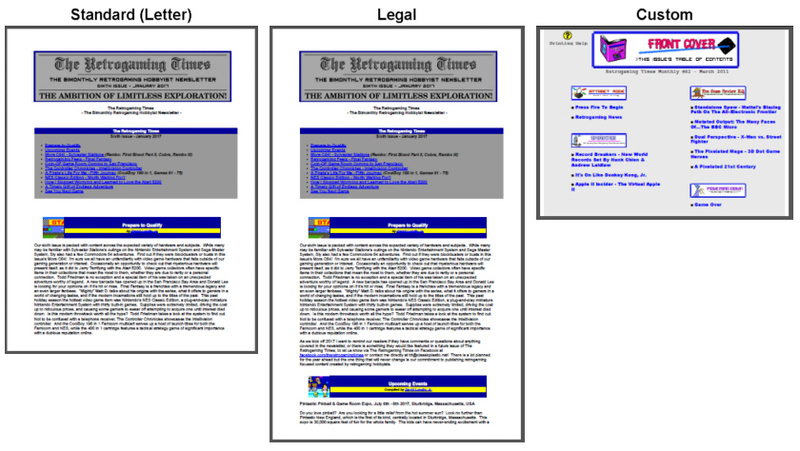 Legal - Legal size pages, more akin to newspaper size and suitable for printing on legal size paper (fewer total sheets). The Retrogaming Times is not responsible for external links within issues. As the newsletter began over twenty years ago, many external links no longer function properly or do not go to their originally intended locations. If you click an external link within a .PDF archival issue, you do so at your own risk. Our newsletter is free BUT BANDWIDTH IS NOT! The Retrogaming Times DOES NOT UTILIZE ADVERTISING! Please do not direct link to any legacy archive files hosted here. All links or mentions should always point to the main index (www.classicplastic.net/trt) as then any changes or updates to the archive will be properly viewed. Additionally please do not redistribute the archives through other sources. The only way a solid, constantly updated, cleanly maintained archive can exist is if there is one source. If it helps you sleep at night, this archive is backed up, on physical media, in three different locations. Please e-mail The Retrogaming Times at trt@classicplastic.net if you encounter a problem with any archive file. Thank you very much and enjoy this journey through the ages! Retrogaming Times issues are still available in their original form at Tomorrow's Heroes. Bit Age Times was published sporadically in tandem with Retrogaming Times. Bit Age Times issues are still available in their original form at Tomorrow's Heroes. This archive was built upon the decades of archival work of past Retrogaming Times and Retrogaming Times Monthly publishers and file hosts. A tremendous special thanks to the countless hours Bryan Roppolo, former Retrogaming Times Monthly Chief Editor, spent in curating an earlier back issue archive. © 2016 - 2019 The Retrogaming Times. All Related Copyrights and Trademarks Are Acknowledged.